the Better Home Inventory Solution. To learn more about Home Ownersite, please take the product tour. Your home is likely to be the biggest investment you will ever make, and we want to help you keep it that way. Home Ownersite makes it easy to safely and securely record all of the important details of home ownership, from a comprehensive, shareable home inventory, to a photo album and file manager to store important home records related to taxes, mortgages, insurance policies and more. Home Ownersite can also provide you with reminders of important home ownership details, including often overlooked maintenance tasks, warranty expirations and mortgage payments. 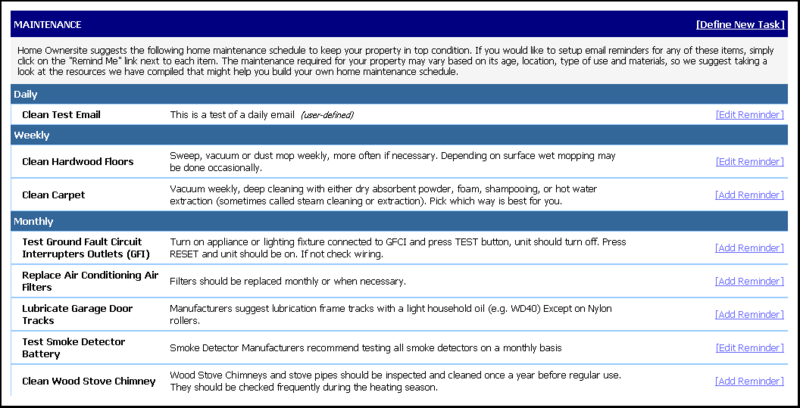 Also included in Home Ownersite is a list of links to helpful homeowner resources on the web and a useful journal to track home maintenance and upgrades. For information on the importance of home inventories, please check out this informative article. Diligent homeowners, insurance companies, contingency planners and real estate agents agree, it is critically important to maintain a comprehensive home inventory. In the past, there were a number of ways to do this, including with pen & paper, spreadsheets, PC applications and even CD's full of photos. Most methods recommended backing up the inventory to a hard-copy of some sort and storing it in a safe-deposit box for safe-keeping. While those methods work, they are not efficient, nor are they always reliable. Your home inventory is an ever-evolving and ever-growing list. We all buy new or replacement items or receive gifts for our homes every day, from jewelry to electronics, appliances to collectibles, and having to constantly visit the safe deposit box to update our inventories is not practical. We all know that keeping critical information on our computers is prone to problems, from forgotten backup to crashed hard drives to spyware and viruses corruption. And, what if you have to share your home inventory? If your PC crashed or was stolen, damaged or destroyed, do you even still have access to it? How often to go to your safe deposit box? If you have a backup or electronic copy, is it up to date? For tips on how to get started building your home inventory, please check out this informative article. 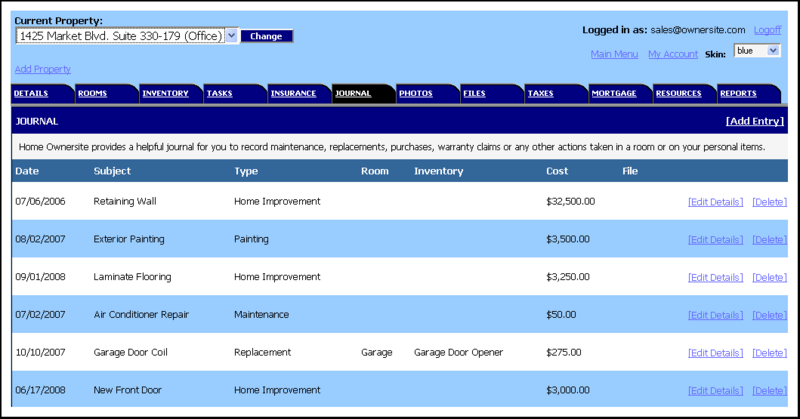 Home Ownersite solves all of these problems, and more. With Home Ownersite, your inventory is accessible anywhere. 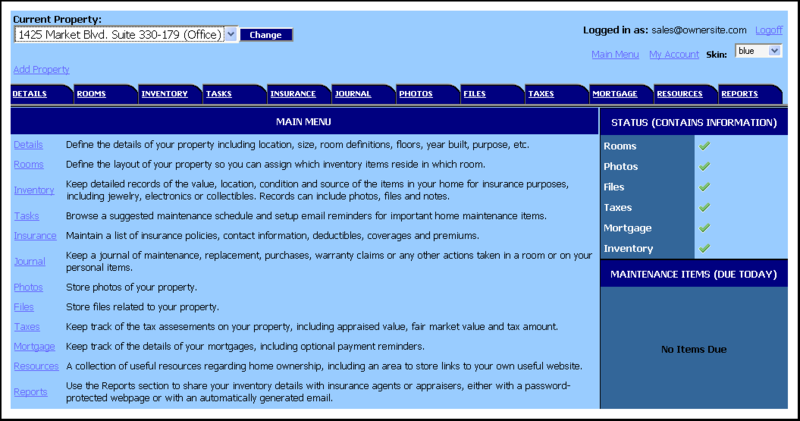 Only you, when logged into your Home Ownersite account, can view your stored images, files and details of your home, with a couple of exceptions. There are the bad times when you will want to share some or all of your home inventory, and we make it quick and easy to do that. In the unfortunate event of a fire, flood, earthquake or break-in, you need to let your insurance company know as quickly as possible what has been lost or damaged. With Home Ownersite, you can create a customizable, password-protected webpage that they can access immediately, with as many or as few details about your items as you desire, including photos and receipts. There are also good times when you need to share some or all of your home inventory, and our inventory webpage can also help with that. If you received jewelry as a gift or inherited valuables from a family member, you may need to update personal insurance policies or riders. Or, if you are unsure of whether you have enough insurance coverage, now would be the time to check. Under these scenarios, you can send your insurance agent a link to a webpage the includes the value of your items, as well as appraisals, bills of sale and unlimited photos. With plans starting at as little as $29.95 per year, Home Ownersite can provide you with immediate peace of mind when it comes to owning your home and protecting your property. And, with plans for multiple properties, people owning a second home or those with rental properties can take full advantage of Home Ownersite wherever they are. To learn more about Trust Guard, please click here. You can rest assured that when you use Home Ownersite, your data and personal information is always safe and secure. Ownersite Technologies has been around for nearly ten years and owns and operates all of its own hardware and software. We have always opted to have full control over our technical infrastructure and not be reliant upon third party solutions to bring you our solutions. Our server infrastructure is hosted in a dedicated environment, not shared with others, in a Class A data center operated by industry leader Sungard. The state of the art facility requires biometric access and multiple levels of security to gain access to our servers. Ownersite Technologies has been certified by Trustwave as having passed the stringent new PCI-DSS guidelines put forth by the credit card companies regarding corporate policies and security infrastructure for its merchants. You can trust Ownersite Technologies and Home Ownersite to maintain and secure your valuable home information. For more information about Home Ownersite's Affiliate Program, please click here. For more information about Home Ownersite's Provider Plan, please click here. Whether you are a homeowner considering Home Ownersite for your primary residence, a renter looking for a way to document your belongings for insurance reasons, an owner of out-of-site rental or investment properties or provide inventory or other services to homeowners, we have something for you. We offer a number of subscription plans starting at only $29.95 per year, from single property plans ideal for homeowners and renters to multiple property plans ideal for investors or owners of vacation properties. 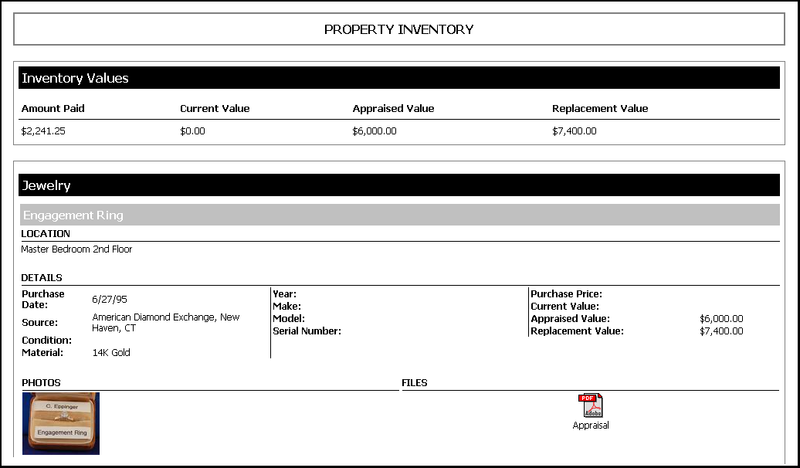 Home Ownersite also offers a Provider Plan for inventory providers or estate attorneys, with a very low-cost per property subscription model. Finally, through our Affiliate Program, businesses like insurance agencies and contingency planners can earn revenue by referring their clients to Home Ownersite. To learn more about the company, please click here. For solutions for vehicle owners, please click here. It is the mission of Ownersite Technologies to provide our customers with the most comprehensive web-based and mobile solutions aimed at increasing the value of their most important assets, like vehicles and homes, either through a direct relationship with the home or vehicle owner or through their service, enthusiast or financial providers. We call this approach "personal asset management." In addition to Home Ownersite, we offer a comprehensive product for vehicle owners called Ownersite. Launched in 2001, Ownersite is the industry leading website for tracking fuel usage, documenting maintenance and receiving service reminders for the conscientious vehicle owner and small to medium sized fleet.